Any kind of mezhukvaratti /fry my mom makes i love it and will surely make some curd rice to go with it.Gobi and matar fry goes well with paratha or roti too specially with a piece of mango pickle . This recipe is not traditionally prepared mezhukvarati but my moms innovation.She used to make this a lot during winter months. 1. Cut cauliflower into very very small florets and leave in heavily salt water for 20-30 minutes. 2. Wash cauliflower , drain and keep aside. 3. Heat oil and mustard and let it pop. 4. Now add cauliflower,chilli,ginger ,turmeric, salt and mix well and cover. 5. Let it cook for 2 -3 minutes and remove the cover. 6. 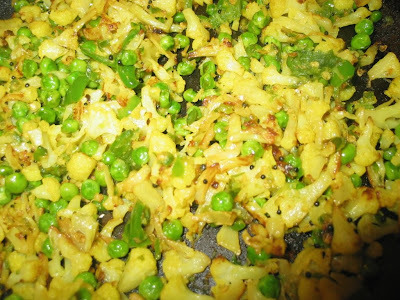 Add peas and mix everything light handedly and cook till cauliflower is done. 7. Serve with roti or curd rice. 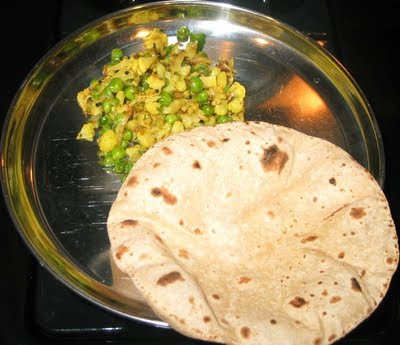 I always make this gobi-peas combo along with dhall. Looks perfect.